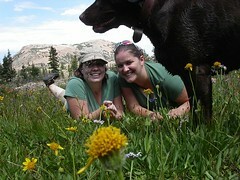 Here is a pic Julie took of me and Becca lying in the meadow. Notice how Molly insisted on being in the pic. Just got this treasure via Becca’s photostream and thought I would add it to my blog.